Eyebrow restoration can also be used in conjunction with eyelid and eyelash enhancements, laser and/or surgery. Whether your brow loss is due to over-plucking, aging, autoimmune disease, burns or trauma – this procedure can use your own hair to permanently restore beautiful brows. In select cases, where supplements and Latisse have failed, eyelash transplantations can also be performed. A 40 year old woman with eyebrow loss due to overplucking during her teenage years and early 20s. She then had 4 rounds of permanent makeup sessions resulting in further hair loss. Dr. Kimberly Cockerham utilized smart graft technology to harvest grafts from the scalp and then insert into a unique patient directed pattern. At the initial consultation, a complete medical history was taken. No hair loss triggers were identified. Classic triggers include hormonal imbalance, thyroid disease, exposure to heavy metals, certain medications, chemotherapy or radiation. Hair, Nails, Skin supplementation with biotin was implemented. Informed consent was provided and all questions were answered. A copy of the consent and post-operative instructions were sent home with the patient. 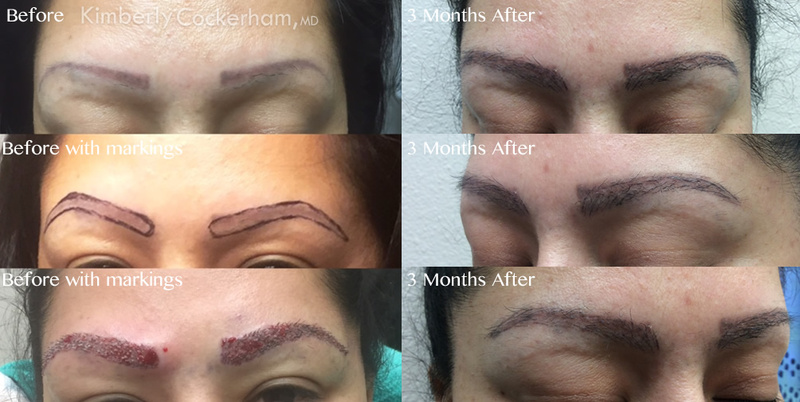 On the day of the procedure, Dr. Cockerham used a surgical marking pen to draw in the patient's preferred shape and thickness for her new eyebrows. In this case the shape was in part limited by the prior permanent make up location and shape. The hair was parted and a small region shaved to allow harvesting of the hair grafts. The region was injected with anesthetic. Smart graft technology was used to extract the follicular units and deposit them in a sterile temperature controlled bath. After 1000 follicle units were extracted, the donor site was dressed with gauze and a wrap. The patient was returned to a seated position and the brow transplantation was completed with artistic precision. Below is a drawing to guide transplant, during transplant, immediately after and 3 Months after transplant. Smartgraft technology allows the hair follicles to be extracted with the least amount of trauma possible and keep the follicles in a temperature controlled bath of either normal saline or platelet rich plasma. The newly transplanted hair goes into a dormant phase approximately 4 - 6 weeks after transplantation. In the case of this eyebrow transplantation patient, her new brow hairs began to grow at 3 months. While the result looks good, more of the follicles will continue to wake up and grow over the next 6 - 9 months for an even better appearance.